To report the progress and treatment of a patient with a severe laceration to his thumb and loss of joint movement. His beginning pain was an 8 on a numerical rating scale, where 0 is no pain and 10 is severe pain. In this case study, an 18-year-old senior basketball player received 3-MHz ultrasound and joint mobilizations twice a week for a total of 12 weeks. Abduction range of motion (ROM) was measured using a goniometer. Strength was not measured. The patient gained full ROM of the thumb (flexion, extension, adduction, and abduction), was pain free (0) able to use a pen, and was able to return to sport activity. Several articles support the use of deep heat and joint mobilizations to increase ROM in injured or post-surgically repaired joints. In these cases, patients regained, on average, 90% of their ROM. This is the first case where deep heat (ultrasound) was used in conjunction with joint mobilizations to restore ROM in an injured thumb. In this case, the patient regained all of his ROM and returned to sport activity. There have recently been several publications where deep heat and joint mobilizations have restored range of motion (ROM) to joints that lacked full ROM due to injury or surgery.1–6 The deep heat used was either ultrasound for wrists3 or pulsed shortwave diathermy for elbows, shoulders, and ankles.1,2,4–6 This is the first reported study where ultrasound and joint mobilizations were used to restore ROM to a thumb (metacarpophalangeal [MCP] joint). An 18-year-old high school senior athlete attempted to climb over a chain link fence and injured his thumb on January 22, 2015. 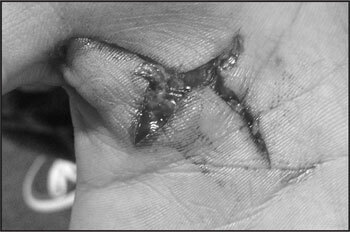 The injury resulted in a full-thickness, stellate, palmar laceration extending from Zone III of the thumb into Zone IV of the palmar surface in his dominant right hand (Figure 1). The athlete went to a medical facility, where the wound was sutured. No surgery was performed. The thumb was put in a splint and the athlete was discharged. On his return to school on January 26, 2015, the athlete presented without the splint and his thumb abducted and flexed, causing the edges of the laceration to be inverted and overlapped. By the time the sutures were removed on February 4, 2015, there were areas where the tissues were splitting apart. One suture was buried within the overlapping sides, which was removed February 11, 2015. Once the last suture was removed, initial rehabilitation was delayed due to partial splitting of the wound. Treatment at this time consisted of basic wound cleansing and daily dressing changes. No other rehabilitation (ROM or strengthening) was attempted at this time due to the risk of continued splitting of the tissue. On February 26, 2015, the athlete presented with enough granulation tissue and a mature scar so that therapy could safely begin (Figure 2). His chief complaint was restricted abduction of 16° in comparison to the opposite hand (his right hand was dominant), and extension. He also reported his pain as an 8 of 10 on a numerical rating scale where 0 is no pain and 10 is severe pain. On evaluation, the athlete was found to have 66° of thumb abduction on the uninvolved side and 50° of abduction when forced passively to maximum end range (Figure 3). Due to the restrictive abduction, accurate extension measurements were not able to be assessed on the injured thumb. The loss of abduction was affecting his activities of daily living. He exhibited loss of strength in that he could not hold a pen, which affected his ability to write. He also complained of a loss of hand strength and fatigue that would occur during class. The primary goal of rehabilitation was to try to restore the abduction first. Abduction and extension of the thumb before ultrasound and joint mobilization treatments. A rehabilitation plan was implemented that included using a Mettler 730 (Mettler Electronics, Anaheim, CA) 3-MHz continuous ultrasound at 0.6 to 0.8 W/cm2 based on patient tolerance for 6 to 8 minutes over the MCP joint and extending into the palmar surface. This is a small area to treat. Based on this, and the fact that 3 MHz heats three times faster and higher than 1 MHz, we believe the dose was appropriate. Based on prior research, this would raise the temperature to approximately 4°C, enough to vigorously heat the area and prepare it for mobilizations.7 The size of the treatment area was twice the size of the transducer’s faceplate or less. During the ultrasound treatment, the thumb was placed in a position of passive abduction. Immediately after the ultrasound was performed, cross-friction massage was used directly over the laceration site for 3 minutes. This was followed by joint mobilization of the MCP joint, primarily using posterior glides for 4 to 6 minutes. This was based on the athlete’s tolerance to the pressure in response to the mobilizations. Treatment (ultrasound and joint mobilizations) was performed twice weekly for 12 weeks. The use of cross-friction massage prior to the joint mobilizations was anecdotally based on the athlete’s perception that massaging the area loosened up the scar tissue and was allowing the joint mobilizations to be more effective. He also initially reported some discomfort with joint mobilization immediately following ultrasound in the areas of the scar that were not directly treated with the ultrasound. This discomfort did not exist if the area was massaged prior to joint mobilization. The athlete reported to the head athletic trainer for treatment an average of 2 days per week. The athlete was also given a home exercise program that included prolonged static stretch in abduction, tennis ball squeezes, and kneading silly putty for another 3 minutes. He was also instructed to self-massage the area of adhesions twice a day to tolerance. The athlete was in full compliance in his home exercise program. By the end of the first week, the athlete increased thumb abduction 2° and reported an increase in both strength and endurance. He continued to progress, increasing thumb abduction 1° to 2° per week until discharge after 17 weeks, with bilaterally equal abduction (Figure 4). He was instructed to continue active stretching and self-massage of the affected area. He also exhibited increased strength, had pain-free ROM (0 on numerical rating scale), and could easily hold a pen. Equal range of motion is apparent when comparing the injured thumb to the uninjured thumb after treatment with ultrasound and joint mobilization. Several articles support the use of deep heat and joint mobilizations to increase ROM in injured or post-surgically repaired joints.1–6 In these cases, patients regained, on average, 90% of their ROM. This is the first reported case where deep heat (ultrasound) was used in conjunction with stretching and joint mobilization to restore ROM in an injured thumb. In this case, the patient regained all of his ROM. In most cases, thermal ultrasound alone may not be sufficient for increasing ROM. Heat and stretch (or stress) are also needed. To illustrate this, imagine that a plastic spoon was dipped in hot liquid. The heat would cause the spoon to become soft and the spoon could be bent or stretched by pulling on the ends. Like plastic, collagenous tissue is fairly inflexible when stressed, yet it becomes less rigid when heated.23,24 The use of heat followed by stretching results in a residual lengthening of connective tissue, which increases in proportion to the force applied by the clinician. The time period of vigorous heating when tissues undergo the greatest extensibility and elongation is known as the stretching window.23,24,32,33 If tissue is heated vigorously, it becomes supple. However, as it cools it resists stretching and can actually be damaged if too much force is applied. The rate of tissue cooling following thermal ultrasound has been measured at both 1 and 3 MHz.32,33 According to this research, it is recommended that stretching, friction massage, or joint mobilization be performed immediately following thermal ultrasound because this stretching window stays open for only 5 to 10 minutes following an ultrasound application. It is recommended that the joint be put on stretch during the last 2 to 3 minutes of ultrasound application if increasing the duration of the stretching window is desired. We note that 17 weeks to restore ROM to an injured thumb is a long time. There is a possibility that the ROM could have been restored without the use of ultrasound and using joint mobilizations only. However, ultrasound makes the area more pliable and there is less pain during the joint mobilizations. Our patient did respond better to the current protocol than prior patients. One of the authors (MKG) shadowed a certified hand therapist from 1996 to 1999. There were some cases where ROM of the thumb was attempted by using whirlpool and stretching of the joints. None of the cases responded as well as our patient. We believe his success was due to the addition of joint mobilizations. Michlovitz SL, Bellow JW, Nolan TP. Modalities for Therapeutic Intervention, 5th ed. Philadelphia: F.A. Davis; 2012. Kuitert JH. Ultrasonic energy as an adjunct in the management of radiculitis and similar referred pain. Am J Phys Med. 1954;33:61–65. Nwuga VC. Ultrasound in treatment of back pain resulting from prolapsed intervertebral disc. Arch Phys Med Rehabil. 1983;64:88–89. Soren A. Evaluation of ultrasound treatment in musculoskeletal disorders. Physiotherapy. 1965;51:214–217. DePreux T. Ultrasonic wave therapy in osteoarthritis of the hip joint. Br J Phys Med. 1952;15:14–19. Aldes JH, Jadeson WJ. Ultrasonic therapy in the treatment of hypertrophic arthritis in elderly patients. Ann West Med Surg. 1952;6:545–550. Dyson M. Mechanisms involved in therapeutic ultrasound. Physiotherapy. 1987;73:116– 120. Dyson M. Therapeutic applications of ultrasound. In: Nyborg WL, Ziskin MC, eds. Biological Effects of Ultrasound (Clinics in Diagnostic Ultrasound). New York: Churchill Livingstone; 1985:121–133. Kloth LC, McCulloch JM, Felder JA. Wound Healing: Alternatives in Management. Philadelphia: F.A. Davis; 1990. Kleinkhort JA, Wood F. Phonophoresis with 1 percent versus 10 percent hydrocortisone. Phys Ther. 1975;55:1320–1324. Bierman W. Ultrasound in the treatment of scars. Arch Phys Med Rehabil. 1954;35:209– 213. Markham DE, Wood MR. Ultrasound for Dupuytrens contracture. Physiotherapy. 1980;66:55–58. Knight KL, Draper DO. Therapeutic Modalities: The Art and Science. Baltimore: Lippincott, Williams and Wilkins; 2012. Draper DO. Facts and misfits in ultrasound therapy: steps to improve your treatment outcomes. Eur J Phys Rehabil Med. 2014;50:209–216. Lehmann JF, Masock AJ, Warren CG. Effect of therapeutic temperatures on tendon extensibility. Arch Phys Med Rehabil. 1970;51:481–487. Gersten JW. Effect of ultrasound on tendon extensibility. Am J Phys Med. 1955;34:362– 369. Castel JC. Therapeutic ultrasound. Rehabil Ther Prod Rev. 1993:22–32. Lehmann JF, DeLateur BJ. Therapeutic heat. In: Lehmann JF, ed. Therapeutic Heat and Cold, 4th ed. Baltimore: Lippincott, Williams and Wilkins; 1990:437–442. Lehmann JF, DeLateur BJ, Silverman DR. Selective heating effects of ultrasound in human beings. Arch Phys Med Rehabil. 1996;47:331–339. Lehman JF, DeLateur BJ, Stonebridge JB, Warren CG. Therapeutic temperature distribution produced by ultrasound as modified by dosage and volume of tissue exposed. Arch Phys Med Rehabil. 1967;48:662–666. Draper DO, Ricard MD. Rate of temperature decay in human muscle following 3 MHz ultrasound: the stretching window revealed. J Athl Train. 1995;30:304–307. Rose S, Draper DO, Schulthies SS, Durrant E. The stretching window part two: rate of thermal decay in deep muscle following 1-MHz ultrasound. J Athl Train. 1996;31:139– 143. Chan AK, Myrer JW, Measom GJ, Draper DO. Temperature changes in human patellar tendon in response to therapeutic ultrasound. J Athl Train. 1998;33:130–135. From Maryvale High School, Phoenix, Arizona (MKG); and Brigham Young University, Provo, Utah (DOD).